Its definitely been a long time since I posted anything and hopefully this post will at least be a little interesting…I haven’t read a great deal of anything financial over the past few weeks so I apologise if this is old news….but I digress!! 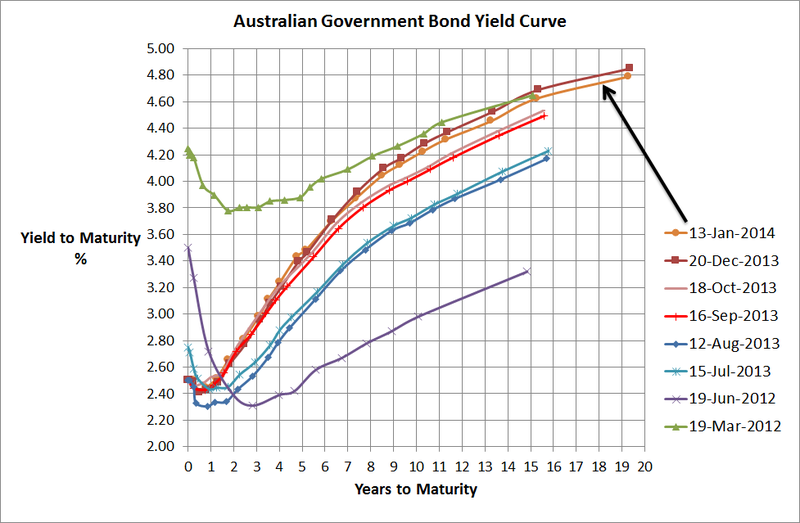 Now, the above chart is the usual Australian Government Bond Yield curve that I always post…why? because it normally says a lot about what’s going on in the world and particularly Australia. In the short terms, i.e. out to 2 Years, it suggests thta the Reserve Bank is more than likely going to keep rates low…that makes a lot of sense whilst the economy is transitioning from a Resources investment boom creating a lot of growth to a relatively unknown economic growth driver. The Reserve Bank definitely want the Australian dollar to be much lower (~85 US cents) but there are other economists believe that it really should be 80cents or lower again. Beyond that, this curve has steepened and today is very steep…and I really do mean very steep…this typically means that the long run economic expectations are pretty strong. I’m not 100% sure why as locally there are many uncertainties but it is true the global economy is looking much stronger than it has in many years or put another way…the major developed economies are not looking like blowing up…so that should help Australia (although I do believe we are a very complacent nation after 22 or 23 years of economic growth). OK…how steep is the yield curve? 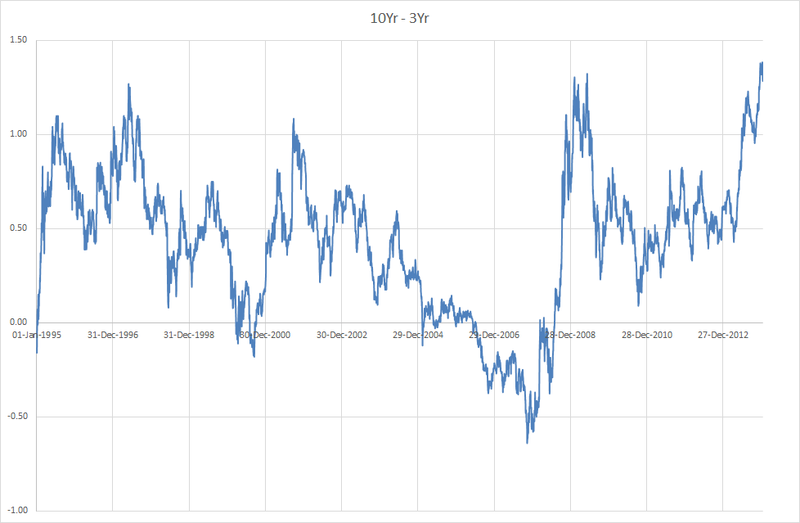 The above chart shows that the difference between the 10 year and the 3 year Australian government bond yields is the highest it has been since the start of 1995 (I haven’t looked for data before then as I’m guessing this is sufficient to make my point). So given this statistical rarity, there’s a very strong chance this relationship is unlikely to hold so the expectation of 3 year bonds to increase more than 10 year bonds is reasonably likely over the next 12 months or so. That doesn’t necessarily make the investment strategy simple because if 3 year bond yields increase and the 10 year bond yield stays the same your bond fund may still have poor returns. However, if the reverse occurs, whereby the 10 year bond yield decreases and the 3 year bond yield stays the same then the returns will be pretty reasonable. Either way, simplistically I do believe a longer duration portfolio is not such a bad thing at the moment…even better if you believe duration may be a reasonable hedge to a falling sharemarket…perhaps the better strategy for the bond manager today may be to short 3 year bonds to buy 10 year bonds.